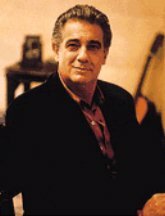 I am obsessed with Placido Domingo. There, I’ve said it out loud. I revisited my passion for the opera early this year and decided to watch my first opera, that of Puccini’s “Tosca”. I ordered all The Three Tenors DVDs and CDs and after watching them a million times, that’s it, I love Placido Domingo, that he is now officially my favorite tenor. He puts so much emotion in his performances you cant help but feel his pain, his triumph, his loss. “No Puede Ser” and “Amor, Vida De Mi Vida” are such powerful arias that make you go weak, and breathless. His rendition of “Granada”, “Cielito Lindo”, “Amapola” is just amazing. He must have been a brilliant Cavaradossi singing “Recondita Armonia” and the heart-rending “E Lucevan Le Stelle”. Have you heard him sing Leoncavallo’s Pagliacci? I’ll stop right now. I listen to just one album on my iPod, and that’s The Three Tenors in Concert, and forward it to the arias he will be singing. Mr Domingo is currently performing at the Royal Opera House playing the lead role in Alfano’s “Cyrano de Bergerac” which has gotten raving reviews and because tickets have been sold out, it’s a shame I couldnt watch him perform. Here’s looking forward to watching him perform before he thinks of retirement. Te admiro señor Domingo. Tu voz es como la de los ángeles. Hasta las chicas filipinas te quieren. Eres el amo del Universo Operístico Mundial. Bravissimo! Oh Gert I am so jealous!!!!! I have just been to your blog and read your entry. Thanks for dropping by.